Is it the job of the Governor General to mock every single religion in one fell swoop? Because that is what Julie Payette did this week all in the name of science. I’m sure that our vice-regal, the computer scientist turned astronaut turned governor general thought she was making simple and true statements as basic as water is wet when she spoke to a group of scientists, but she went further than that and forgot what her new role entails. She made comments about climate change, about junk medical science but also ridiculed pretty much all major religions when she made these comments. “And we are still debating and still questioning whether life was a divine intervention or whether it was coming out of a natural process let alone, oh my goodness, a random process,” Payette said. So maybe I need to explain this in the language of the elites. Diversity. Our new GG also mocked Jews, Muslims, Sikhs, Hindus. You get the picture. If this how Madame Payette feels about religion that is her business but as the Queen’s representative it is not her role to mock religious belief. I should also point out that the Queen herself is the head of a religion, the Anglican Church, that believes in this idea Payette just mocked. It seems that our esteemed vice-regal has a simplistic view of the interplay between science and religion, that they cannot co-exist. You meet these people all the time, they yell about Galileo but ignore hundreds of years of fides et ratio working side by side. Georges Lemaitre was the Catholic priest that first put forward what is now called the big bang theory on the creation of the universe in 1927 and published what became known as Hubble’s Law two years before Edwin Hubble did. There are many others I could point to including many from other faiths. All of them, and all of their coreligionists, have been dismissed as rubes by a woman that is supposed to be a unifying force. Payette also mocked people that think sugar pills can cure cancer – I’m not sure those people actually exist. She mocked horoscopes, something most people ignore and those that do read them generally do so for amusement. And she challenged the idea that climate change can even be debated. “Can you believe that still today in learned society, in houses of government, unfortunately, we’re still debating and still questioning whether humans have a role in the Earth warming up or whether even the Earth is warming up, period,” she asked. If Ms. Payette is the scientist she claims to be then she should be encouraging debate, not stifling it. Much of what we now consider settled science was once dismissed and scientific theories that we believed true for hundreds of years have been dismissed. Newton’s laws of physics held sway for years and yet scientists keep arguing if they hold. A few years ago a group of scientists used lasers to “break” Newton’s third law, an experiment still being argued over. If it is declared invalid then it will simply join the long list of other theories debunked by a new generation of scientists. Ms. Payette may think she is standing up for science with her comments but she is doing the opposite. 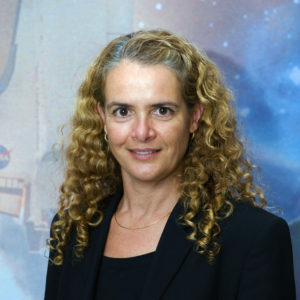 The biggest and best thing that Julie Payette could do, if she wants to be successful in her new role, is to learn what job she has just accepted. Given her comments this week, her high-handed and dismissive tone to those she disagrees with, I’m not sure she has a clue what she signed up for. Let’s hope that changes. Quickly. UPDATE: A reader sent me the video of Payette’s comments. Watch the eye-rolling, the disdain is complete. Luckily, other than providing a platform from which to bloviate from, the position is largely ceremonial. Funniest part is, she’s anti-monarch as well? It’s a good thing she doesn’t get any power with the mace. The elites are so profound , complete and convinced that what they think and know is all YOU and I really need to know We got this, drink the Cool Aid fool. I wouldn’t have minded her mocking of religion IF she had included the religion of catastrophic man-made climate change! As a Christian Canadian this woman just made herself look like a complete idiot given the role she should respect and honor. I am sure the queen must be appauled by the way she mocked religion. I agree with you Brian she has not a clue of what her role intails. I am sure even Trudeau and his green global elite are fuming over questioning climate change being man made. Apparently her parents forgot to teach her respect and that sometimes it is best to reserve dignity and selfworth by keeping certain personnel oppions to yourself..Who does this woman think she is GOD!! Oops wait she does not believe in God..
Julie Payette is supposedly very smart, if all the common sense had not been educated out of her. Lets hope she has the sense to accept The Queen as a shining example of the way she should conduct herself. I certainly do not begrudge her her opinions but she really has to learn that figureheads should not weigh in on politics. Your job is not to determine who does not believe in climate change. Just do your job GG Payette. Please just do your job and see what trudeau is doing to Canada. Or are you just listening to what you want to here. Or maybe what Trudeau wants you to hear? I certainly hope you use your brain. Show us we can trust you. She should be given the boot . And yes Brian that’s what I was thinking , she insulted every religion , how will the little prince handle this one , o.m.g she dared to insult Islam. How do you fire a Govener General, quickly I hope. Queen Elizabeth will likely have her replaced quickly…This woman is not the kind of person for this job…She has zero understanding of others religious beliefs…Even if she is a non-beliver she shouldn’t run other people into the ground because she doesn’t understand…Just ridiculous!!! It is said first impressions are critically important. Having read this blog then seeing the video,this woman?,in her role,this Canadian is “not” amused! NOT impressed!!. That had to be the most embarrassing thing a G.G. Has done to the people of Canada. Talking down to the masses. Should be interesting how this gets handled. Mocking the beliefs of the people she represents, I am sure is not in her job description. I don’t like her personality. Another BRILLIANT appointee from our “Exalted Leader”, Justin Trudeau. Not only does Ms. Payette need a complete do-over on her hair (ghastly! ), she needs a complete do-over on her brain. If she truly believes that mankind is to blame for the climate change and it’s human population of the planet that is responsible. Then she and her envro elitists can be the first to swallow the Jim Jones KoolAid to begin the thinning out of the herd. Don’t see any of their like stepping up quickly but they sure as hell would be the ones forcing it down throats of who they believe as undesirable. A sad day indeed, when the holder of this office would mock those of us who believe in God and His plan. Science and Religion are not separate things. God’s plan starting from the beginning of time and He gave us the ten commandments the rules that we live by and it is His plan that we discover all that is around us, below us and above us in order that we may have a true understanding and learn how to Love one another and Him to get to understand all things both seen and unseen. A very poor choice for an important office. A pity that smart doesn’t mean wise. Her last statement that mentions , listening to what we want to hear. Dear Ms Payette you are entitled to your views and I am to mine. In your field you have far greater experience and knowledge than I. Yet you must step outside of your field and represent the Queen in Canada who like a grandmother smiles and listens to the next person. Remember that you are not above us to lecture but to be. Did you not read your job description. ‘We are not amused’ by this soap-box orator from outer space — who is passing herself off as Canada’s unbiased representative of the Queen. (I learned that the role of a Governor-General was similar to that of a Committee Chairman: to be impartial, and not enter into the fray — or express personal opinions, I wonder if ANY ‘Rules of Order’ apply anymore). Scorn is still ugly, thousands of years since this was penned. Scorn is also bad science. Scorn is not evidence. Promoters of man-made global warming still fall short in the science. Moreover,the science of the first cell coming together by natural means is even further from finished. Many scientists have completely abandoned even trying. She may be smart, but don’t be fooled. She may have lots of scorn but she does not have science that under-girds it. Many religious people also believe in the resurrection of Jesus Christ. As it turns out, the gave is still empty. How is that for evidence? This woman,(note I don’t say lady) categorically and blatantly just thumbed her nose to the Queen. Perhaps this is going to turn into a little English vs French thing again. Book smart and intelligent don’t always go hand in hand. I thought the GG represented the Queen. Wonder if Queen E. gave permission for Payette as GG and representative of the Monarchy to speak publicly to Canadians about her personal opinions!?! I agree with Brian Lilley that she overstepped her duties to Canada and showed her distain for the Canadian people. It’s ok to be a barking partisan hack GG if the barking partisan hack GG dutifully reads from the Liberal book of dogma…..
Perhaps she should also avoid any reference to a spherical earth lest she offend those who believe the earth is flat. Unbelievable and now the Governor General will never do her job and she should be removed from office also! Scientist ha ha ha! •	inviting the leader of the party with the most support in the House of Commons to form the government. That party leader becomes Prime Minister. •	in times of emergency or special circumstances, exercising the special personal authority of the Governor General to appoint or dismiss a prime minister or dissolve Parliament. This authority is rarely used. •	receiving and sending ambassadors. Right now, she is a joke, well at least, she is not the Prime Minister of Canada. She made a comment about “creationists” not any other aspect of religion. You’ve blown her comment out of proportion. The world IS NOT 6000 years old. That is undisputable.